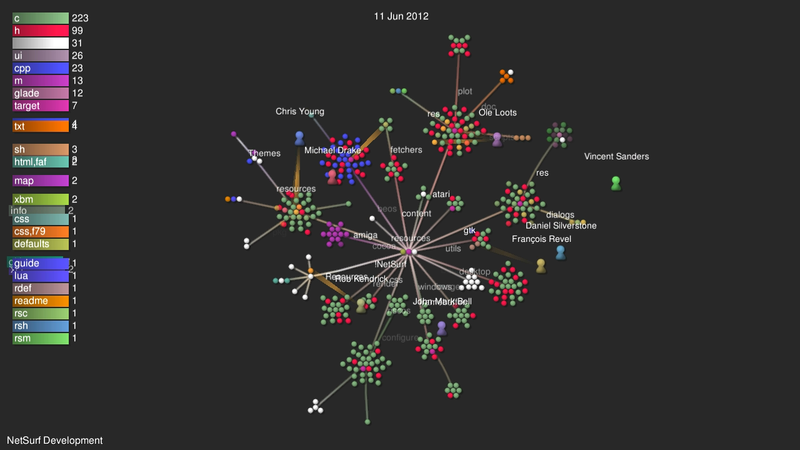 I have used the Gource tool for a few years now to produce visualisations of project history. The results are pretty but not especially informative and mainly serve to show how well maintained a projects revision control history is. The results do however provide something pretty to put on projectors and screens at shows when there is nothing better to be displayed. Recently I noticed the Gource tool got updated and I decided to compile it and give it a try. After the usual building of the dependencies (including all of libboost!) the new version (0.38) gives much better results than the previous edition I had been using (0.27). I tested it on the NetSurf git repository generating an overview for the whole ten years the project has been running which produced a six minute video which I shall be using on the NetSurf stand at our next show. 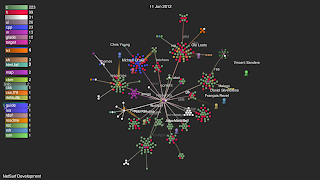 Overall if you need a historical visualisation of your projects revision history Gource is a pretty good tool. I have also used the alternative "code swarm" tool in the past but that seems to have bitrotted to death so I cannot recommend it. Can Gourse do multi-repository stuff, since that vid you did was only the netsurf.git repo and none of the libs. unfortunately not, unless you manually write a repository log merge tool. Gource itself is actually not much more than a log file visualisation with convenient log generation integration for git, svn and hg. I used to do a svn->git repo conversion for NetSurf specifically leaving out everything I did not want Gource to precess! A sander is a power tool that people use to make things smoother, such as wood finishes or other surfaces. It uses automotive action and sandpaper-like rotary abrasions to accomplish this effect. Most sander types are powered with electricity, but some of them use compressed air to reach the desired result.